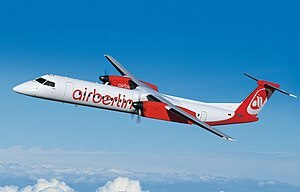 The DHC-8 Dash 8 is a series o turboprop-pouered regional airliners, introduced bi de Havilland Canada (DHC) in 1984. ↑ "Q400 Program Status Report" (PDF). Retrieved 2018-08-26. ↑ 2.0 2.1 Jane's all the world's aircraft. 2005. ↑ "List Prices - Commercial Aircraft". Bombardier Aerospace. January 2017. This page wis last eeditit on 11 Februar 2019, at 21:22.